A summary of elements in biotoolsSchema is below. For more detailed information, please see the technical documentation. When producing XML files compliant to the schema, it is essential to stick to the element order (including nested elements) as described below. See the sample XML files. 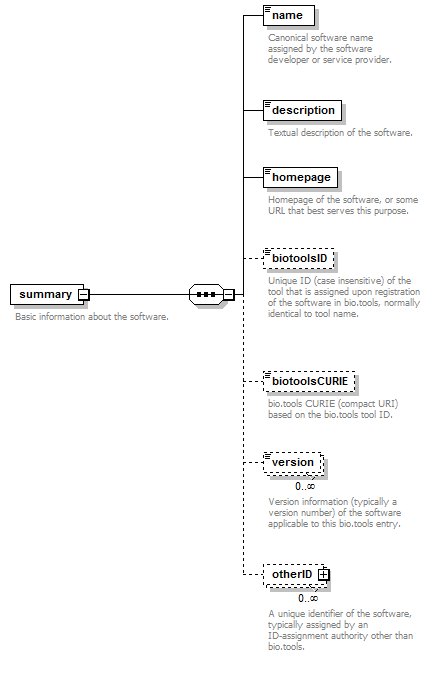 biotoolsSchema includes scientific, technical and administrative software attributes, organised for convenience into 8 logical groupings (see below). Summary summary Basic information about the software. Function function Details of the function(s) (i.e. 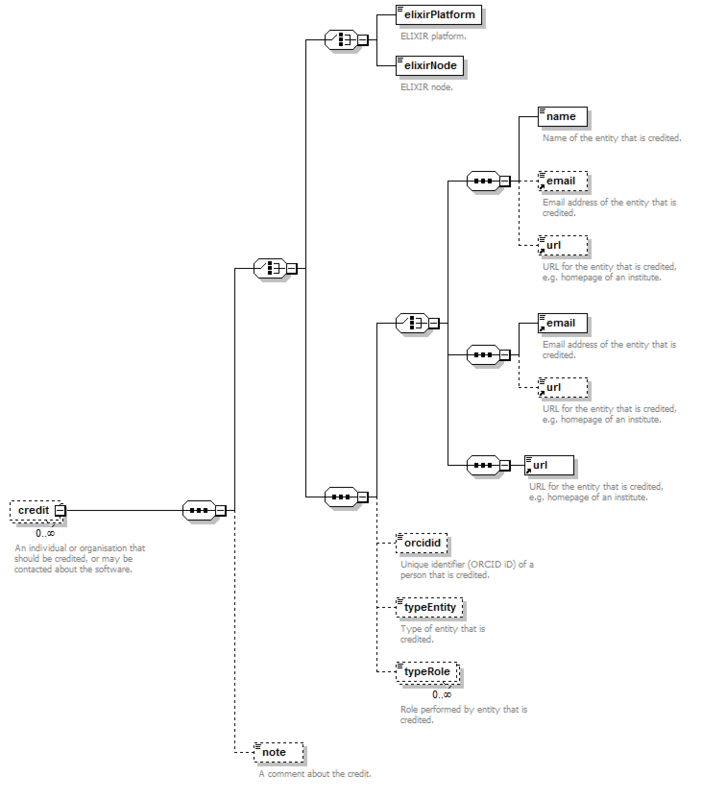 modes of operation) the software provides, expressed in terms from the EDAM ontology. Labels label Miscellaneous scientific, technical and administrative details of the software, expressed in terms from controlled vocabularies. Links lnk Miscellaneous links for the software e.g. repository, issue tracker or mailing list. 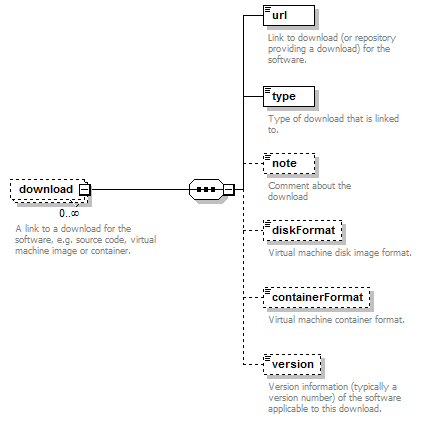 Downloads download Links to downloads for the software, e.g. source code, virtual machine image or container. Documentation documentation Links to documentation about the software e.g. manual, API specification or training material. Publications publication Publications about the software. Credits credit Individuals or organisations that should be credited, or may be contacted about the software. Details of a function (i.e. 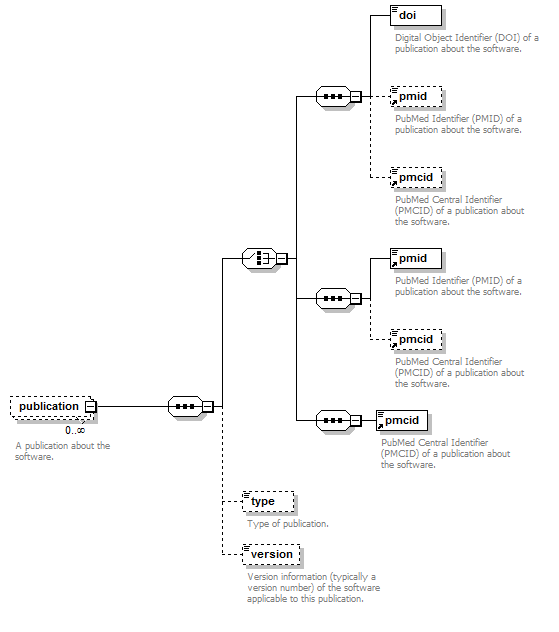 mode of operation) the software provides, expressed in terms from the EDAM ontology. 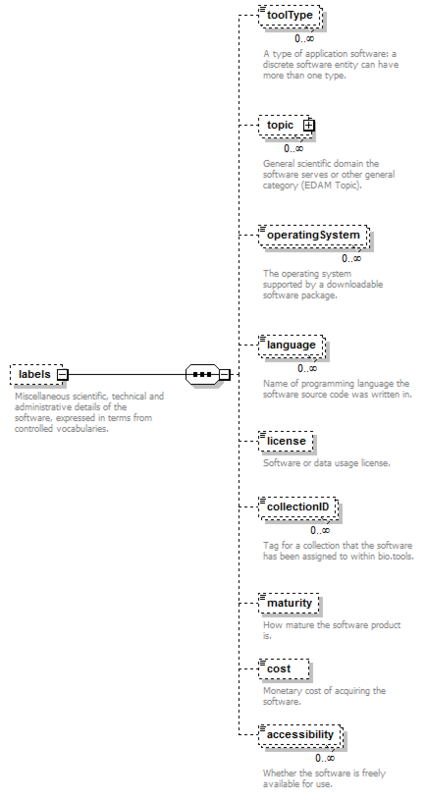 Each software entity has one more functions, each corresponding to a mode of operation that the software provides. 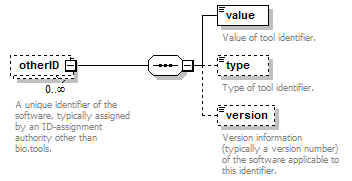 Each function performs one or more basic operations, and has zero or more primary input and/or output data, each of a specified type and supported format(s). For each operation, data or format element, an EDAM ontology concept URL and/or term are specified. 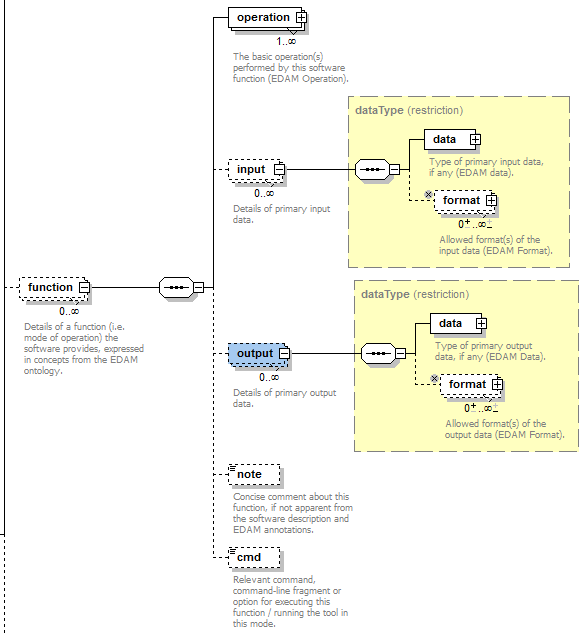 Data and Format are modelled in the same way as Operation (shown above). input Details of primary input data. output Details of primary output data. The URL must be in the appropriate EDAM Operation | Data | Format namespace, e.g. The term, e.g. “Multiple sequence alignment” must be either the preferred label of the concept or a synonym of this term, as defined in EDAM. © Copyright 2018 Revision 0f5a343d.